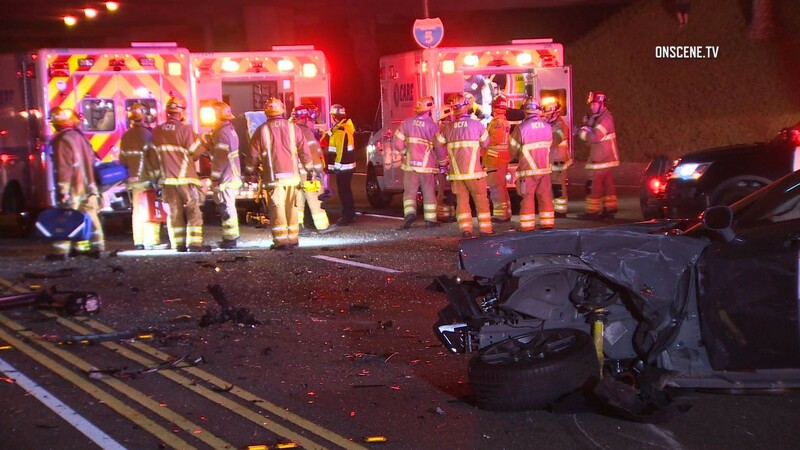 A Chula Vista woman was killed and nine other people, including three children, were injured in a chain-reaction series of crashes Thursday on the southbound Santa Ana (5) Freeway near the Alton Parkway exit in Irvine, and a suspected drunken driver was arrested for allegedly causing the pileup. Firefighters responded about 1:30 a.m. and located nine vehicles and multiple victims, which included children ages 11, 10 and six months, Orange County Fire Authority Capt. Tony Bommarito said. Eight patients, including the three children, were taken to trauma centers, Bommarito said. A woman was transported to a hospital with minor injuries, he said. The six-month-old child was in the same vehicle as the Chula Vista woman who was killed and the two other children were in a different vehicle, Bommarito said. According to the California Highway Patrol, 22-year-old Irving Aguilar-Calixto was driving a Dodger Challenger south on the 5 Freeway at a high rate of speed when he slammed into a Toyota Prius. The Challenger spun out and came to rest on the freeway, prompting another collision that involved the Challenger and four other vehicles, according to the CHP. The driver of a Honda Civic swerved to avoid the pileup, coming to a stop next to the damaged Challenger, but moments later, the Honda was struck by a Mitsubishi Eclipse. The woman driving the Eclipse survived the initial crash, but CHP officials said she apparently unbuckled her seatbelt to remove her infant son from the rear seat of the Eclipse, which was then struck from behind by a van, killing the woman and injuring the boy. Aguilar-Calixto was arrested on suspicion of DUI. All southbound lanes of the freeway were closed for hours to accommodate the investigation and clearing of vehicles from the roadway. The freeway was reopened around midday.